With a numbered limited edition of only about 500 and a one year lease price of about $820, the MINI E won't be finding a whole lot of takers, but its still a car that will attract a lot of interest. The two seat all-electric car delivers 204 HP and 162 lb-ft of torque and runs on 28 kWh of a 35 kWh capacity battery made of 5,088 individual lithium ion cells and will take the MINI E a full 156 miles before a recharge at it's dedicated wall box is needed — a scant two and a half hours for that job! Acceleration is a brisk but not blinding 8.5 seconds to 62 MPH and top speed comes when you reach 95 MPH. With such low production numbers, this MINI is more of a field test for the real life of an electric car and the results will be used in future vehicle developments. Complete details below along with a nice rant if you scroll all the way down. MINI AT THE 2008 LOS ANGELES AUTO SHOW. THE MINI E. 11/18/2008 A new Experience - Driving Pleasure Without Emissions: The MINI E. Short Version. Long Version. MINI E - Technical Specifications. The BMW Group will be the world's first manufacturer of premium automobiles to deploy a fleet of some 500 all-electric vehicles for private use in daily traffic. The MINI E will be powered by a 150 kW (204 hp) electric motor fed by a high-performance rechargeable lithium-ion battery, transferring its power to the front wheels via a single-stage helical gearbox nearly without a sound and entirely free of emissions. Specially engineered for automobile use, the battery technology will have a range of more than 250 kilometers, or 156 miles. The MINI E will initially be made available to select private and corporate customers as part of a pilot project in the US states of California, New York and New Jersey. The company is looking into expanding the MINI E pilot to include Europe. The MINI E will celebrate its world premiere at the Los Angeles Auto Show on November 19 and 20. The MINI E's electric drive train produces a peak torque of 220 Newton meters, delivering seamless acceleration to 100 km/h (62 mph) in 8.5 seconds. Top speed is electronically limited to 152 km/h (95 mph). Featuring a suspension system tuned to match its weight distribution, the MINI E sports the brand's hallmark agility and outstanding handling. By introducing the MINI E, the BMW Group is underscoring the resolve with which it works towards reducing energy consumption and emissions in road traffic. The BMW Group is drawing on its unique technological expertise in the field of drive systems to develop a vehicle concept enabling zero emissions without renouncing the joy of driving. Putting some 500 cars on the road under real daily traffic conditions will make it possible to gain widely applicable hands-on experience. Evaluating these findings will generate valuable know-how, which will be factored into the engineering of mass-produced vehicles. The BMW Group aims to start series production of all-electric vehicles over the medium term as part of its Number ONE strategy. The development of innovative concepts for mobility in big-city conurbations within the scope of "project i" has a similar thrust, as its objective also includes making use of an all-electric power train. The energy storage unit: cutting-edge lithium-ion technology engineered specifically for use in the MINI. Based on the current MINI, the car will initially be available as a two-seater. The space taken up by back-seat passengers in the series model has been reserved for the lithium-ion battery. When in use in the zero-emissions MINI, the battery unit combines high output with ample storage capacity and a small footprint with power ratios that are unrivalled in this field of application so far. The lithium-ion storage unit will have a maximum capacity of 35 kilowatt hours (kWh) and transmit energy to the electric motor as direct current at a nominal 380 volts. The rechargeable battery is made up of 5,088 cells grouped into 48 modules. These modules are packaged into three battery elements that are compactly arranged inside the MINI E. The energy storage unit's basic components are based on the technological principle that has proven itself in practice in power supplies for mobile phones and portable computers. The MINI E's lithium-ion battery can be plugged into all standard power outlets. Its charge time is strongly dependent on the voltage and amperage of the electricity flowing through the grid. In the USA, users can recharge a battery that has been completely drained within a very short period of time using a wallbox that will ship with every MINI E. The wallbox will be installed in the customer's garage, enable higher amperage, and thus provide for extremely short charging times. Wallboxes fully recharge batteries after a mere two-and-a-half hours. Driven by electricity: reliably, affordably and free of emissions. A full recharge draws a maximum of 28 kilowatt hours of electricity from the grid. Based on the car's range, a kilowatt hour translates into 5.4 miles. Besides the benefit of zero-emissions driving, the MINI E thus offers significant economic advantages over a vehicle powered by a conventional internal combustion engine as well. The heavy-duty battery delivers its power to an electric motor, which transforms it into thrilling agility. Mounted transversely under the MINI E's bonnet, the drive train unleashes its full thrust from a dead standstill. This provides for the car's fascinating launch capability. The MINI E's intense driving experience is augmented by its dynamic deceleration potential, which is also directly coupled to the accelerator pedal. As soon as the driver releases the gas pedal, the electric motor acts as a generator. This results in braking force, and the power recovered from the kinetic energy is fed back to the battery. This interaction ensures extremely comfortable drives - especially at medium speed with constant, but marginal, variation. In city traffic, some 75 percent of all deceleration can be done without the brakes. Making substantial use of this energy recuperation feature extends the car's range by up to 20 percent. Signature MINI agility in a new guise. Weighing in at 1,465 kilograms (3,230 lbs), the MINI E has an even weight distribution. Minor modifications made to the suspension ensure safe handling at all times. The Dynamic Stability Control (DSC) system has been adapted to this model's specific wheel loads. The MINI E's brake system comes with a newly developed electric underpressure pump. Its Electrical Power Assisted Steering (EPS) is the same as the one used in mass-produced MINIs. Both brake and steering assistance react to driving conditions and are thus extremely efficient. Even the air conditioning's electrical compressor only operates if desired or necessary. Design: unmistakably MINI, undoubtedly new. At first glance, the MINI E is obviously an iteration of the brand. But its design, which is the blueprint for the zero-emissions two-seater, has been complemented by a number of visual cues that point to its revolutionary drive concept. All of the units produced for the pilot project will have the same paintwork and bear a serial number next to their side turn signal lights. The MINI E's coachwork sports an exclusive combination of metallic Dark Silver on all panels but the roof, which is clad in Pure Silver. What distinguishes the zero-emissions MINI is a specially designed logo in Interchange Yellow, depicting a stylized power plug in the shape of an "E" set against the silver backdrop. It has been applied to the roof, in smaller dimensions to the front and back, to the charger port lid, the dashboard trim, and - combined with the MINI logo - to the door jamb, in slightly modified form. The color of the roof edges, mirror housings, interior style cues and seat seams will match the logo's yellow tone as well. Moreover, the central gauge and the battery level indicator behind the wheel of the MINI E, which replaces the MINI's rev counter, feature yellow lettering against a dark grey background. The battery level is displayed in percentage figures. The central gauge includes an LED display indicating power consumption in red and power recuperation in green. MINI E customers will be part of a pioneering mission. A 500-unit, limited-production MINI E series will be manufactured through the end of 2008. The project will thus attain an order of magnitude that clearly exceeds the size of currently comparable test series. Putting the MINI E on the road on a daily basis will be a pioneering feat to which both the drivers and engineers of the first zero-emissions MINI will contribute as a team. 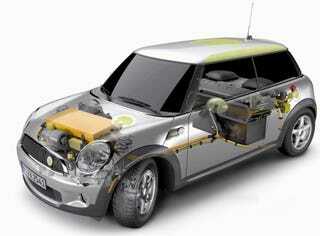 MINI E customers will join forces with BMW Group experts to assist in the project's scientific evaluation. MINI E engineers accord high importance to staying in touch with the drivers on a regular basis, as this will help them analyze driver behavior besides vehicle characteristics in order to gain the most accurate and realistic picture of the demands placed on a vehicle with a purely electrical drive in the select usage areas. Special charging station and full service for every MINI E. The cars will change hands based on a one-year lease with an extension option. Monthly lease installments will cover any required technical service including all necessary maintenance and the replacement of wearing parts. At the end of the lease, all of the automobiles belonging to the project will be returned to the BMW Group's engineering fleet where they will be subjected to comparative tests. The MINI E's lithium-ion battery can be charged using a wallbox provided to MINI customers. Only lockable garages or similar buildings will qualify as homebases and power stations for the MINI E. Maintenance by qualified specialists. The electric drive's high-voltage technology requires that maintenance work be done by qualified personnel using special tools that are not included in MINI service partners' standard toolboxes. In light of this, a service base will be set up on both coasts, staffed by service engineers that are specially trained to perform maintenance and repair work on the MINI E's electrical components. In the event of drive malfunction, these experts will provide professional support at the customer's local MINI dealer or the service base's specially equipped workshop. Technical inspections will take place after 3,000 miles (just under 5,000 kilometers) and at least after six months. Production in Oxford and Munich. The MINI E has already gone through the major phases of product development for mass-produced vehicles and passed numerous crash tests on the way. Aspects investigated besides passenger protection were the impact of collision forces on the lithium-ion battery and finding a non-hazardous location for it in the car. The MINI E's energy storage unit emerged completely unscathed from all of the crash tests mandated by US standards, which are especially high. Production of the approximately 500 cars will take place at the company's Oxford and Munich sites and is scheduled for completion before the end of 2008. MINI's UK plant will be responsible for manufacturing the entire vehicle with the exception of the drive components and the lithium-ion battery, with the brand's series models rolling off its assembly lines concurrently. The units will then be transferred to a specially equipped manufacturing complex situated on BMW plant premises where the electric motor, battery units, performance electronics and transmission will be integrated.